In most influencer campaigns, there are three primary stakeholders. You are probably one of them; a brand, an influencer, and an audience. Each of you has something unique to gain from the other as well as something unique to offer. Being able to both contribute and benefit is where the concept of shared value originates. Shared value is a philosophy and a business practice that should be explored and practiced to make all those in an influencer marketing ecosystem happy. The long-term benefits of shared value relationships are loyalty, impact, enhanced communication, better return on investment and financial reward. Let’s start with understanding the big picture, the needs of all stakeholders and where these overlap. This graph shows some of the objectives, goals, and desires of the three groups. These are not ALL of the possible goals of each, but an example for the sake of getting across the point. You can substitute the ambitions for all on a campaign by campaign basis. An audience wants to be understood by a brand. Brands want to better understand their consumers. Influencers can offer a solution for both sides by providing brands with relevant insights into their audience. I have found that market research with influencers is a super underutilized benefit of influencer collaborations! Influencers can take advantage of the additional production value of working with brands to create high quality, authentic content that their audience wants to consume and engage with. The brand’s objective to amplify their content can be correlated to the influencers goal of getting paid for access to their audience. When a brand remunerates an influencer, they receive greater reach and impact. When brands collaborate with influencers to build advocacy, influencers solidify their business, brands receive added value from the influencers and audiences develop stronger loyalty to the brand. These are just a few of the cases where value can be shared by the community around your brand. It is important for brands not to think of themselves as islands, but as contributors to a wider economy of values. 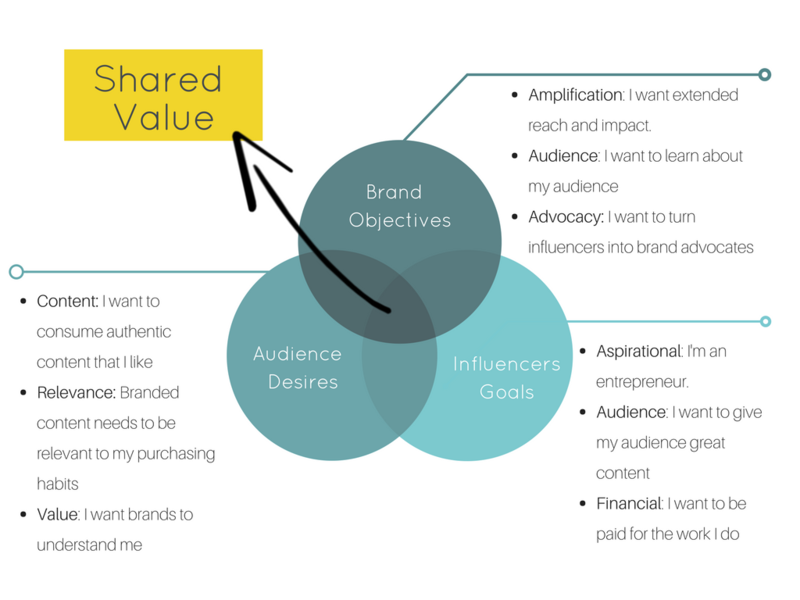 When starting to think about a strategy that involves influencer, consider using the graphic above as a template which you can fill in with your own unique objectives. This is a concept that takes time and practice to get right. We need to be open to learning, making mistakes and trying again. When the result is one in which everyone wins, the effort is compounded to produce long-term results. It’s important to note that sharing value does not mean meeting everyone’s needs. As a brand, you do not need to contribute something that does not provide a reciprocated value. Similarly, influencers need not provide a service if it does not benefit them to do so. Brands, influencers, and audiences are on their own journeys to meet their goals. The magic happens when there is overlap in the journey.